According to Leonardo, man himself was at the centre of everything– “The measure of all things”. Throughout his life, the artist engaged in a dynamic and increasingly in-depth examination of man as a living organism, embarking on a seemingly unending quest to discover how man moved, grew, developed and perceived the world in which he lived. Leonardo’s intense study of nature equipped him for the imaginative exploration of pictorial themes based on concepts developed from his imagination. 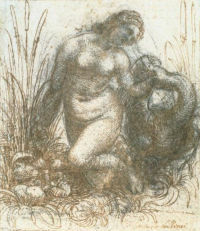 In this drawing of the mythical Leda and the Swan, Leonardo expresses the generative powers of nature. According to the legend, Leda, the wife of Tyndareus, King of Sparta, was seduced by Jupiter in the form of a swan and bore two eggs, from which hatched Helen of Troy with Clytemnestra, and Castor with Pollux. Leda’s fruitful liason with the Swan symbolised the union of man and nature. Here the fecundity of their union is underlined by the children just hatched from their eggs, and the flowering and seeding plants that surround both Leda and the swan. Leda turns her face to the swan, chastely caressing it with her left hand. Curving, hatched lines articulate the voluptuous forms of her figure and round out her body in three-dimensions. Spiralling forms predominate throughout the drawing in the shapes of the plants and the forms of the children, Leda and the swan. This provides a sense of energy and movement and expresses the dynamic force of nature. And the works of nature are far more worthy than words, which are the products of man, because there is the same relationship between the works of man and those of nature as between God and man. Therefore, it is nobler to imitate things in nature, which are in fact the real images, than to imitate in words, the words and deeds of man. In this drawing of the mythical “Leda and the Swan”, he expresses his feeling for the generative powers of nature. According to the legend, Leda, the wife of Tyndareus, King of Sparta, was seduced by Jupiter in the form of a swan and bore two eggs, from which hatched Helen of Troy with Clytemnestra, and Castor with Pollux. Leda’s fruitful liaison with the swan symbolized the union of man and nature. In this drawing the fecundity of their union is underlined by the children, just hatched from their eggs, and the flowering and seeding plants that surround both Leda and the swan. Leda turns her face to the swan, chastely caressing it with her left hand. Leonardo articulates the voluptuous forms of her figure with curving, hatched lines that round out her body in three-dimensions. Spiralling forms predominate throughout the drawing, in the shape of the plants, children and in the forms of Leda and the swan, providing a dynamic sense of energy and movement in the drawing. Leonardo explores the relationship between Leda and the swan particularly through the position of the swan’s head and neck, which have been redrawn several times in charcoal or soft black chalk before finally being fixed in pen and ink.